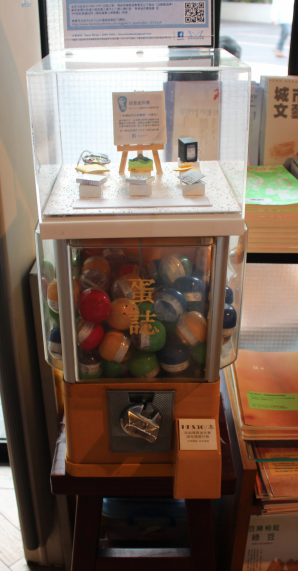 In a bookstore, the smell of coffee filled the air, a Japanese Gashapon is standing at the corner unexpectedly. Gashapon is a vending machine-dispensed capsule toy, but this one is a little bit different. Once you put in a coin and turn the crank, what is expecting you is not a toy, but a transparent circle capsule with a miniature books sized 45mm. Miniature books are like any other books but printed on a smaller scale which is no more than three inches in height, width or thickness. Reading themes range from dictionaries, religious allusions to well-known stories. 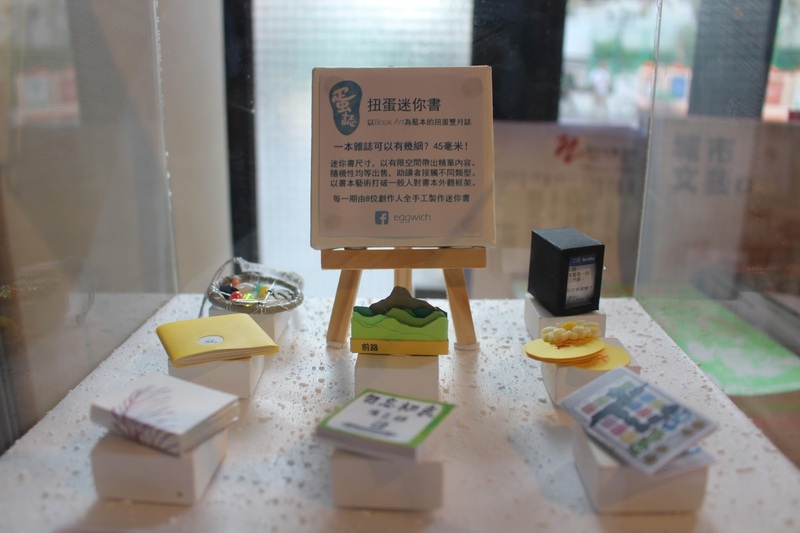 But instead of buying the final product from publishers, some people are making handicraft miniature books in Hong Kong and selling them as capsule toy. Ms Tiana Wong Tin-ying, chairperson of the Hong Kong Miniature Book Association, has always been a hand-made book lover and creator because it helps her to relieve stress. 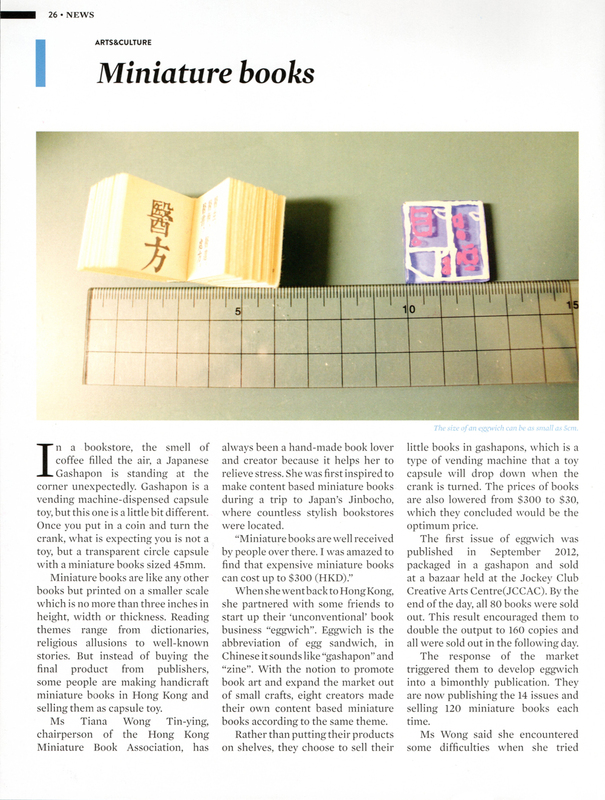 She was first inspired to make content based miniature books during a trip to Japan’s Jinbocho, where countless stylish bookstores were located. When she went back to Hong Kong, she partnered with some friends to start up their ‘unconventional’ book business “eggwich”. Eggwich is the abbreviation of egg sandwich, in Chinese it sounds like “gashapon” and “zine”. With the notion to promote book art and expand the market out of small crafts, eight creators made their own content based miniature books according to the same theme. Rather than putting their products on shelves, they choose to sell their little books in gashapons, which is a type of vending machine that a toy capsule will drop down when the crank is turned. The prices of books are also lowered from $300 to $30, which they concluded would be the optimum price. The first issue of eggwich was published in September 2012, packaged in a gashapon and sold at a bazaar held at the Jockey Club Creative Arts Centre(JCCAC). By the end of the day, all 80 books were sold out. This result encouraged them to double the output to 160 copies and all were sold out in the following day. 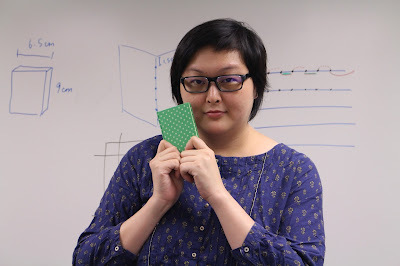 Ms Tiana Wong Tin-ying, chairperson of the Hong Kong Miniature Book Association, has always been a hand-made book lover and creator. The response of the market triggered them to develop eggwich into a bimonthly publication. They are now publishing the 14 issues and selling 120 miniature books each time. So she did thorough background research on the development of miniature books in other places and target at the patriotic character of the storekeeper. 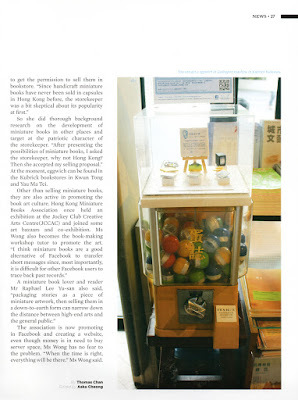 “After presenting the possibilities of miniature books, I asked the storekeeper, why not Hong Kong? Then she accepted my selling proposal.” At the moment, eggwich can be found in the Kubrick bookstores in Kwun Tong and Yau Ma Tei. The size of an eggwich can be as small as 5cm. The association is now promoting in Facebook and creating a website, even though money is in need to buy server space, Ms Wong has no fear to the problem. “When the time is right, everything will be there.” Ms Wong said.